WOW! Your generosity never ceases to amaze us. We raised $2754.50 with our online raffle for Ella and if she had her way, she would personally come to each and everyone of your houses and give you a great big kiss! Congrats to Gen, Gloria, Cheryl, and Roxanne for winning the prizes! Thank you to all who donated prizes and all of you who bought raffles. She goes in for surgery on Friday so please keep sending out thos positive thoughts for her. We will keep you posted on her recovery! One of our former adopters wrote a fantastic letter published in the Langley Times. Editor: If all pit bull owners must muzzle their “dangerous” dogs in public, then so must owners of all other “dangerous” dogs. This would be breeds such as German shepherds, dobermans, rottweilers, chihuahuas, cocker spaniels, and every other dog that is feeling cranky and isn’t comfortable with children or strangers. There is a reason behind the support of many dog owners for the saying “Ban the deed, not the breed.” Any dog may bite a person. Any dog may be turned into a dangerous dog, either through training, neglect, or abuse. The owner is the one responsible for making a dog “dangerous.” An irresponsible dog owner creates the situation in which a person or another dog is put in danger. Owners of dogs (with a bad reputation or not) must take precautions to guard against having accidents happen: learn the body language of their dog, learn how dogs interact with the world around them, don’t allow just anyone to approach and get in the dog’s face, know your dog. Owners must avoid situations where the dog doesn’t do well. Have a fully fenced yard that the dog can’t get out of, be around to supervise the dog — especially around children; teach the people you encounter what you’ve learned. Regardless of what breed of dog you have, be responsible. Way to go Lynda! Thank you for letting your voice be heard and defending this breed. 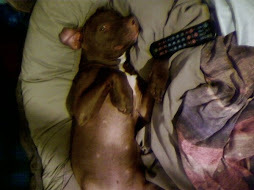 Oh and for being a responsible Pit Bull owner. WELCOME TO LUKAS-OUR 300TH DOG!!!! Yup, you heard right. Cutey-pie Lukas is number 300. We couldn't believe it ourselves when we realized it. Since Bully Buddies started in 2002, 8 have passed away due to health issues (6 from one litter of puppies), 6 have been euthanized for behavioral reasons, 3 have been transferred to other rescues, 12 are still with our group. A total of 271 dogs have been adopted!! To all of the volunteers who make this number possible and to the dogs that we love--here's to the many dogs to come. 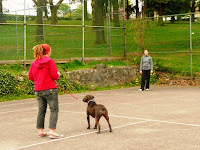 Re: Pit bulls not Pomeranians, Letters to the editor, Burnaby NOW, May 24. Why is it that people write about that which they know nothing about? If these same people would only do some research before they put pen to paper. So-called "pit bulls" have no stronger jaws than other dogs of their size, it has been documented on the web if only people would look. Never in Canadian history has a "pit bull" ever killed a child. But many other breeds have. There has only been one fatality from these dogs, and their owner was being attacked by a bat-wielding drunk. The interesting thing here is, on average, there are about nine serious dog attacks a year. However, there are about 147,000 animal cruelty complaints made every year. According to stats from the National Canine Research Council showing how high these dogs rate on temperament testing, they tie with golden retrievers. It is amazing how gullible the public is and how most serious attacks don't make it to mainstream media, except if they can even remotely put the name "pit" in a headline. Sadly, these dogs are commonly mistaken for the other 23 official breeds and many attacks end up being mistaken identities. I am amazed, especially in this information age, how so much misinformation still gets published. I weep for these dogs as they are so abused by man, used by media to sell papers and now being set upon by an misinformed public. Ignorance and misinformation is flourishing, even in Canada. 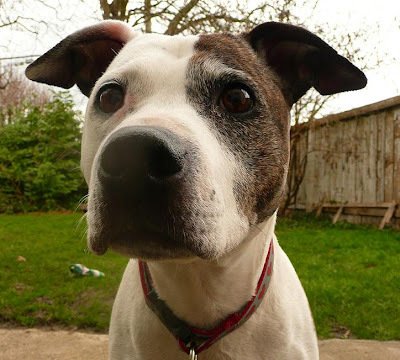 Luka is looking for a new home and would love it if you would consider him for your home. He's about 7 months old and is so cute! He's good with dogs and loves going to the beach. 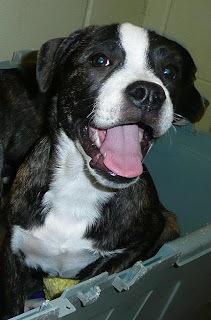 Please email us at bullybuddies@gmail.com if you are interested in meeting Luka. Winston is off exploring this big world with his new family. Neko is so big! We knew her as this clumsy puppy and now she looks so grown up. Hard day at the office for Luca Miss Merry, home on her couch right where she belongs! Oh Nicolas. You are in your glory and we couldn't be happier for you. Watch out for this girl. Young and sassy, Peanut's new mom will be making sure this girl grows up to be an amazing breed ambassador! How fantastic is this article! Thank-you to Voutilainen for showing great understanding of dog behavior. When it comes to pit bulls, Ryan Voutilainen's philosophy is simple: ban the deed, not the breed. 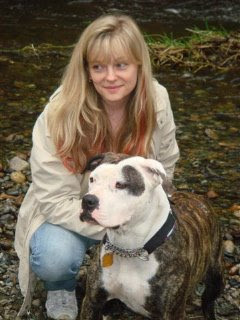 When asked if pit bulls should be banned in Metro Vancouver, the manager of Burnaby's SPCA branch answered "definitely not." "Any dog that, generally, has bitten somebody has done that because we've failed it in some way, not because of the dog," Voutilainen said. He also said that if pit bulls are banned, it sends the message that other breeds are completely safe. "It gives people a false sense of security that their animal would be fine," he said. Last week, a pit bull attacked an 11-year-old Surrey boy at a school playground. A neighbour came to his rescue and fought the dog off with a baseball bat. The boy suffered wounds to his legs, arm and head and required surgery and more than 100 stitches. "They don't know how to react around other dogs and around people," he added. "The big thing is education, and educating people that dogs have requirements." That also means knowing whether your dog needs a muzzle when it's taken out in public, he said. But Voutilainen said muzzles shouldn't be mandatory for pit bulls. "I don't think that's necessarily a requirement, either," he said. He describes pit bulls as "status dogs," often sought after because of their tough, muscular look. 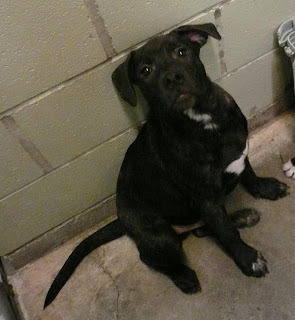 At the shelter, they are treated like any other dog, he said. 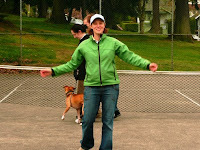 I get to hang out with Sarah and she teaches me all sorts of cool things about dog behavior and training. 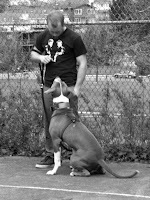 Then I get to test my skills and help people like Bryce train his foster dog Rock. You guys are doing an awesome job with him by the way. I get to see certain dogs week after week and see them improve. Mr Narone here has been getting daily trips every Saturday out of the Vancouver Animal Shelter to work on his obedience and get some time away from the stressful life at the shelter. He is such an amazing dog; none of us can believe that he hasn't found his forever home yet. Thanks to Caitlyn for coming out and training him this week. 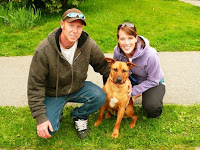 I get to see some of our Alumni, like Rhea, with their new owners and know that we made the best decision possible! I get to hang out with big dorks like Rock and get bully kisses! They all know me as the cookie lady so they make sure to pay extra special attention to me. I meet other owners who are just like me and who absolutely adore their pit bull. They are committed to the pit bull breed and want to ensure that their dog is a well-trained ambassador who is out there changing attitudes. Miss Jada here is an amazing dog who clearly adores her owner! On this particular Saturday. 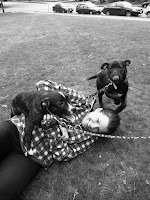 Sam brought a few of the Cabbage Patch Kids to hang out and their foster homes could pick them up from the training. Everyone got their puppy cuddles and our puppies got a lot of great exposure and socialization. This Saturday was also very special for this cutey-pie. I went and picked Martin up at the crack of dawn (well, 830 sure felt early as I hadn't had my coffee yet!) and he hung out with me all day. His new family came to meet him at the training session and everyone agreed that it was a good match! It is currently a foster-to-adopt situation but we sure are keeping our fingers crossed that Martin makes himself right at home. So that is my Saturday. I hope you all enjoy them as much as I do! My foster dog Ella has had a bit of a rough go of it as of late. First she came in as a stray to the Prince George SPCA, where she was considered unadoptable due to being a senior. Fortunately the staff fell in love with her, so much so that the Manager drove her down to the Lower Mainland! She quickly had the entire Bully Buddies crew swooning over her, and was doing great until one day she got sick and had a seizure. They found that Ella has a Grade 3 heart murmur and heart that is twice the size it should be. She is now on monthly heart medications . The vets then found a softball sized tumour on her adrenal gland. 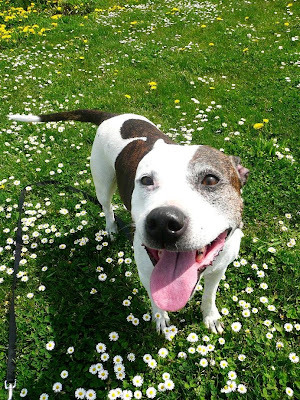 On Thursday May 8th she will be heading into the specialists at Can-West vet clinic, for further diagnosis, and to look at surgery possibilities for the tumour. To date her vet bills have totaled $845.38 The Can-West bills are expected to total at least $300, with surgery costs to follow. Ella is an amazing dog. When she gets through all of this we are hoping to get her registered as a Therapy Dog because she has a wonderful, gentle temperament. People are just drawn to her where-ever she goes. 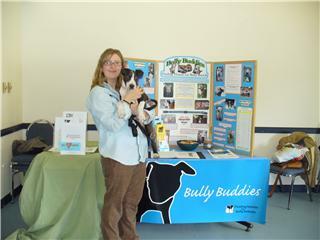 She has become our official PR dog at local events, and recently won-over the crowd at the SPCA Open House. We are holding a raffle fundraiser for Miss Ella, in order to help cover all of her health needs. Tickets are 1 ticket for $2 or 3 tickets for $5!Two amazing baskets are available- one for humans, the other for your beloved canines. Tickets can be bought online through Paypal (bullybuddies@gmail.com), or via cash, cheque or credit card.Draw will take place May 31, 2008. 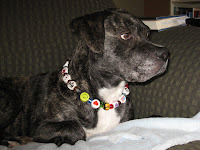 Thank-you for supporting Ella and Bully Buddies! Fantastic Prizes to be Won!! 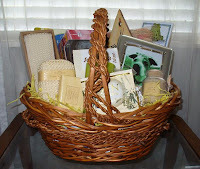 1st Prize – a great “Pamper yourself” basket, including a hair make-over via Satellite Salon (Vancouver)!! 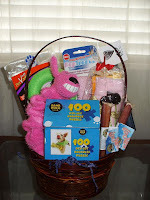 2nd Prize– a pamper your pooch basket, with toys, treats and games galore!!! Nobody wants to hear that a child, or anyone for that matter, has been mauled by a dog. 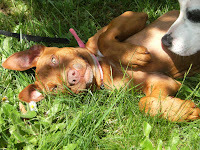 As Pit Bull lovers we feel even worse when the dog is related to the breed that we love. This was a terrible, and totally preventable incident. Sean Bajwa and his father have shown themselves to be level-head, compassionate, and commendable in the face of such a terrible incident. We thank them for recognizing the importance of responsible ownership and realizing that any dog has the potential to bite and do harm. As a Pit Bull lover I am so thankfull that they understand that this is not an issue of breed. Our heartfelt sympathy goes out to the Bajwa family as they cope and recover. As someone who has worked in Animal Control, I am used to hearing firsthand accounts of dogs mauling people. Most of these stories never make it to press because the dogs involved are not one of the breeds sensationalized by the media. Even when victims have wanted their story told, it never made media headlines. When a mail carrier was savagely attacked by a Standard Poodle, she fought hard to have her story told. She wanted people to see that any dog can cause severe injuries, and that responsible ownership is the key- dogs should not be running loose regardless of breed. Looking at bite stats in local communities, in Delta the number one breed of dog responsible for bites to humans or other animals was Labrador Retrievers, with Golden Retrievers following in second place for number of bite cases. These two breeds made up over 60% of the bite incidents in Delta, in one year. In the same year German Shepherds were the number one bite-incident dog in North Vancouver. Does this mean that these are the most dangerous dogs in this municipality? No, it suggests that there are large numbers of these breeds in these Cities, and that not all of their owners feel the need to be responsible. 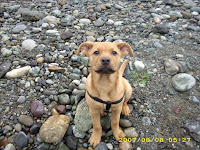 What these bite cases typically have in common is that their owner's were not acting in a responsible fashion- they were under-socialized or running loose or allowed to act protective. As the Bajwa family understands, any dog can bite. Laws need to take into account owner culpability. 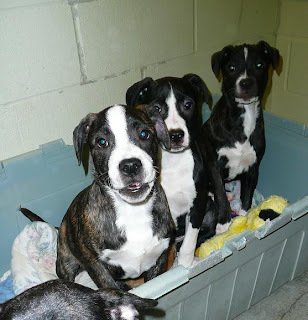 Well, looks like all these pups have found foster homes so now the next step is to get them adopted. Thanks to all of those who have offered to foster one of the veggie munchkins! 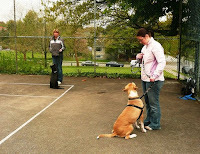 We were lucky enough to get invited out to the Vancouver SPCA's Open House again this year. Although the weather wasn't the greatest, lots of people showed up. 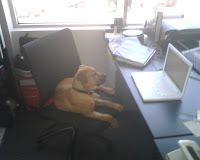 Miss Ella made her first appearance as the official Bully Buddies PR dog and she takes this job very seriously. She even wore her brand new sweater. This boy is currently up for adoption through the Vancouver SPCA. His name is Cane and he is a big loveable, smushable American Bulldog! He spent some time out and about and got alot of attention with his goofball ways. Alumni Marlo stopping bye to say hello. Him and his brother Sampson were both there as their moms' work at the SPCA. They are both getting so big and are so well-mannered! Kudos to their families for recognizing the importance of bringing a puppy up right. Well, after working so hard a gal need to keep her strength up somehow. Lollipops seem to do the trick! Thanks again to the Vancouver SPCA for inviting us to this great event. Who wants some puppy love? 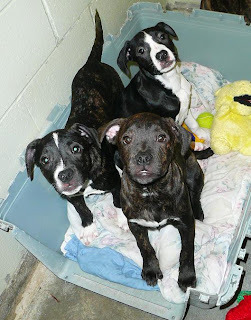 We are currently looking for foster homes for 5 oh-so cute three month old puppies. Meet Broccolli, Artichoke, Yam, Radish, and Asparagus. 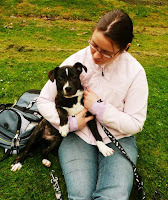 They are looking for a home that will help them with their basics (like housebreaking and crate training) and get them out and about and show them around the world! Artichoke is the largest and most confident male. He already loves playing with toys! 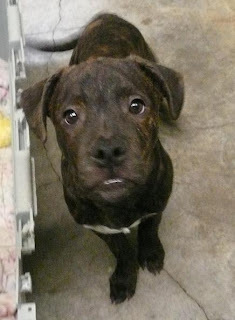 Broccoli is the other male and has got the cutest underbite! The girls! Yam, Radish, and Asparagus showing off how cute they are. And Yam, already learning how to ham it up for the camera. So if you think you want to open up your house to all the joys and love and chaos that is puppy fostering, please email us at bullybuddies@gmail.com. Martin and Tibbs are trying oh so hard to woo themselves a place of their very own. Both boys are lovely dogs but for very different reasons. Meet Martin. Young, energetic and oh so smart, he just got to have an overnight sleepover to give him a break from the shelter and his foster family says he's an absolute dream. 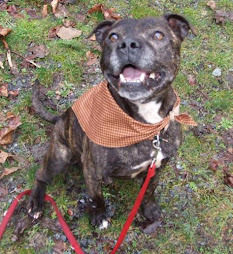 Good out and about but calm and mellow when indoors this boy is a real catch! He'd love to find an active family that is looking for someone to do agility or flyball with but would do good just as a companion dog for hiking and camping. We are still looking for a foster home for Martin so drop us a line if you think you'd like to meet him. This is Tibbs. He is a gentle soul who just spent the last weekend curling up in a foster home and giving the baby kittens a tongue bath. Tibbs would love to spend his days lounging at your side and curled up on your couch. I had the pleasure of hanging out with him while I was doing some work at his foster home and we just hung out on the couch together, snuggling and just generally being happy about our day. He truly is a wonderful dog. Looks like those kittens weren't the only ones in need of a bath! Please consider either of these dogs for your home. We are looking for a foster home for Martin as well to get him out of the shelter so even if you're not too sure about being a permanent match you could help him on his way to his forever home! Ella will be making her appearance at this year's Open House; working her charm on everyone. In other news, please think good thoughts for Ella. An ultrasound discovered that she has a large adrenal tumour. She is booked to see the specialists at Can-West on Thursday May 8th to ascertain whether the tumour can be removed. They will also be looking at her heart to determine what shape her heart is in. In the meantime, Ella continues to garner a huge fan club. This week she was borrowed from her foster home in order to visit a person who is just recovering from surgery. There is nothing like this sweet pooch to cheer people on.